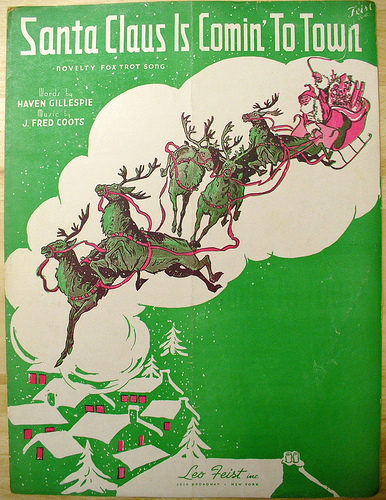 Written by the songwriting team of J. Fred Coots and Haven Gillespie, “Santa Claus is Coming To Town” had a spectacular debut. The song was first sung on Eddie Cantor’s radio show in November, 1934. On the day after the broadcast, there were 100,000 orders for the sheet music; by Christmas, over 400,000 copies of the sheet music had been sold. “Santa Claus Is Coming To Town” was recorded in June 1967 and released the next year on the album Snowfall: The Tony Bennett Christmas Album. It was arranged by Robert Farnon. “Santa Claus Is Coming To Town” was recorded in 2004 and released in 2008 for A Swingin’ Christmas. It was arranged by Bill Holman and features Andy Snitzer on alto sax.